YouthNation is an indispensable brand road map to the youth-driven economy. 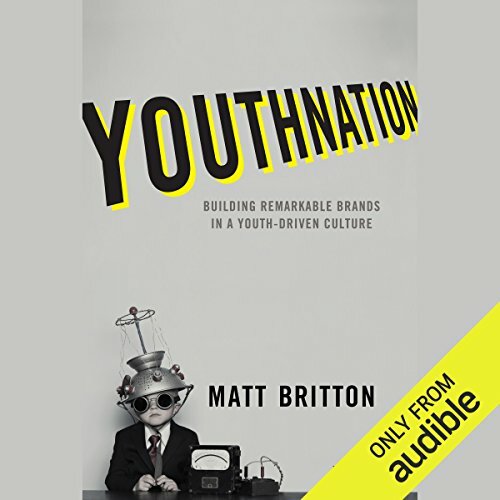 Exploring the idea that youth is no longer an age - it's a commodity that's available to everyone - this book shows what it takes to stay connected, agile, authentic, and relevant in today's marketplace. Listeners will learn the ins and outs of the new consumer and the tools, methods, and techniques that ensure brand survival in the age of perpetual youth. Coverage includes marketing in a postdemographic world, crafting the story of the brand, building engaged communities, creating experiences that inspire loyalty and evangelism, and the cutting-edge tricks that help businesses large and small harness the enormous power of youth. The old marketing models are over, and the status quo is dead. Businesses today have to embody the ideals of youth culture in order to succeed, and they can do so by tapping the new and rapidly evolving resources in business and in life. When everything is changing at the pace of a teenager's attention span, how do businesses future-fit for long-term success? This book provides a plan and the thoughts, strategies, and brass-tacks advice for putting it into action. In today's hypersocialized, Facebook fanatic, selfie-obsessed world, youth is the primary driver of business and culture. Smart companies are looking to tap in to the fountain of youth, and the others are sinking fast. YouthNation is a roadmap to brand relevancy in the new economy, giving businesses turn-by-turn directions to their market destination. ©2015 MRY US, LLC. ; Published by John Wiley & Sons, Inc., Hoboken, New Jersey (P)2015 Audible, Inc. The book describes Millennial culture which sources Daily Show, Facebook, Instagram, SnapChat, LinkedIn etc to view peers, brands, politics & current events. Very interesting. However the author's repetitive self-congratulation on his PR firm & it's ability to market to youth strongly turned me off. I don't know if it was there for filler,or to satisfy his narcissism. Profit was the book's motive--how to understand the younger generation and use that info to market to them as successfully as possible. How to attract and retain them as employees with dog-friendly workspaces, wall-free offices and a full time barista. I appreciate his cultural information, but the lion's share of thh book is devoted to branding and selling by appealing to YouthNations tastes and values. What does Joe Knezevich bring to the story that you wouldn’t experience if you just read the book? Narration was well-done; pleasant, credible voice. Engaging actionable insight from one of the brightest minds on the subject of Millennial disruption. loved this book. The message is clear. The way the world communicates is changing, what do you need to do to stay ahead of the game?